Sometimes a sunny Saturday afternoon needs a sweet, sparkling, probiotic beverage. And if you don’t regularly brew kombucha or water kefir, then ginger bug is the perfect alternative. Mix all the ingredients until the sugar is dissolved. Cover with a piece of cloth or a coffee filter held in place with a rubber band or metal ring. Place somewhere warm and allow to ferment for 3 days (stirring each day). Once you have bubbles strain the mixture and bottle it. 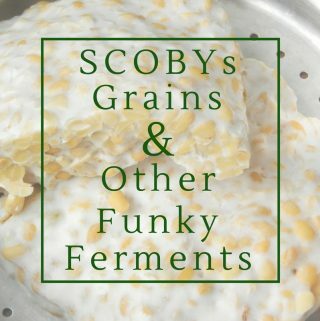 Allow it to ferment for a further 3 to 5 days to build up the carbonation. You may need to add more sweetener at this time (to taste). Once it's fizzy, refrigerate and enjoy! Ginger bug sodas are best if consumed within four weeks of bottling. The ginger bug needs sucrose for the initial ferment. However, for the second ferment (the bottled ferment) feel free to sweeten to your taste with any kind of sweetener. You will get more bubbles with 1 tsp of white sugar in each bottle. The sucrose will be consumed by the ginger bug, so there won’t be as much sugar in your final beverage. You can use straight juice as the liquid for a sweet ginger bug soda. Since juice is high in fructose, the sweetness won’t be consumed by the ginger bug. Otherwise, I recommend a mix of 1/3 juice and either water or brewed tea. that can handle the pressure of carbonation. 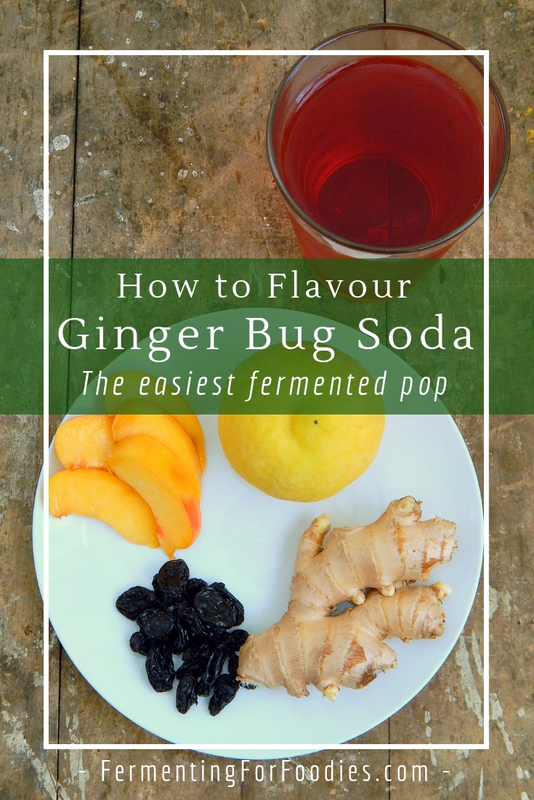 See the section below for ways to flavour your ginger bug sodas. Juice: I recommend using clear juices, like blueberry, apple or pomegranate. If you want a sparkling lemonade then use just 1/2 cup of lemon juice mixed into filtered water. Avoid juices that have added preservatives, as they will slow down the fermentation. Teas: Unlike jun or kombucha, you can use any flavour of tea for your ginger bug sodas. Herbal, black or green teas will all add a unique flavour. When experimenting with flavouring ginger bug sodas, don’t forget that the flavour of ginger will always be there. Strong and Spicy Ginger Beer: Follow this recipe for a very gingery ginger beer. Lemonade: Use 1/2 cup of lemon juice mixed with filtered water along with the zest from 2 lemons. Pomegranate Punch: Use 2 cups of pomegranate juice with filtered water for a bright pink concoction. Iced Chia: Brew chai tea, and add 2 tbsp of honey. The only will add both flavour and sweetness. Stir in a little bit of milk or cream before serving. White Mint: Brew white tea, add in 3 large sprigs of fresh mint leaves. Cream soda: Brew black tea, add in 1/4 cup of raisins and 1 vanilla bean split in half. 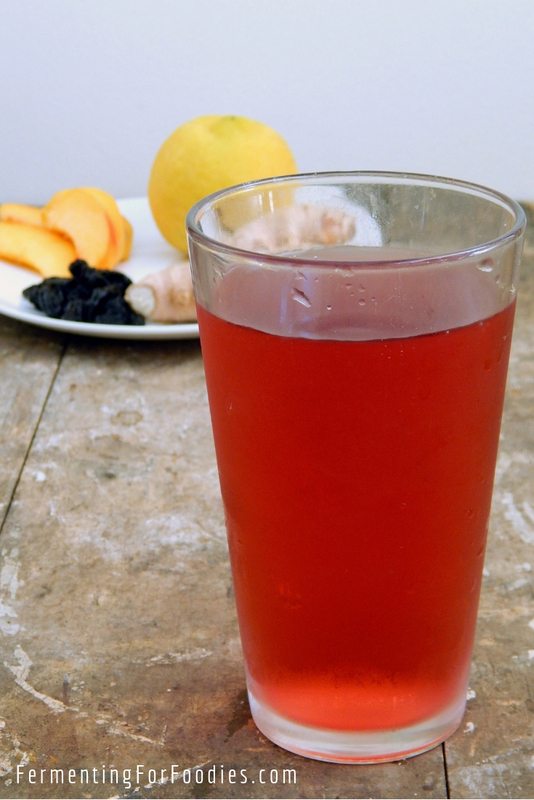 Gingered Peach: Finely chop 1 peach and mix with green tea for the 3 1/2 cups of liquid. Immune Booster: Use 1/2 cup of cranberry juice, 2 tbsp of grated fresh turmeric, and the juice and zest from 1 lemon. Holiday Ginger ale: Cranberry ginger ale is a winter tradition. Though the bright red beverage is delicious at anytime of year. What is the ginger bug starter? Where do I get this from? It’s something that you make, simply from the yeasts in your environment. 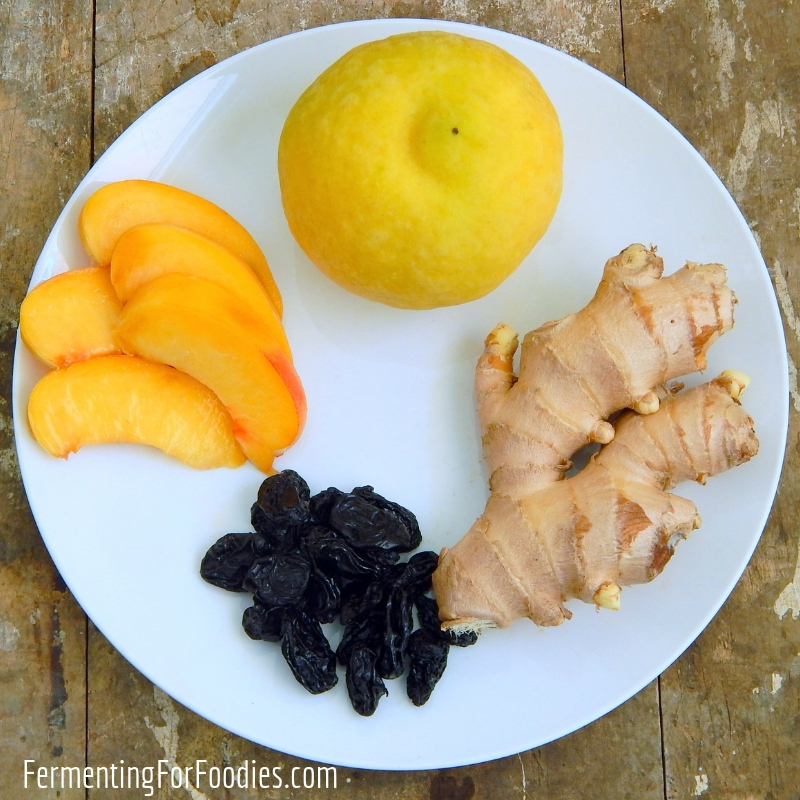 Here’s the link for making the ginger bug: https://www.fermentingforfoodies.com/archives/1599. It should only take you about a week. When you use”Bug”. Do you use just the liquid or both, ginger and liquid? Then how do you replace what you use:1/4c.H2O,1Tbs each,ginger and sugar? You only need to use the liquid. It should be full of live bugs all on it’s own. I’ll update the recipe to make that more clear. Thanks! I don’t think the question is really answered. I wonder about the liquid also. We take out the liquid and want it replenished for my next batch. Directions on keeping a continuous brew. This post is about flavouring ginger bug; for info on post on feeding and maintaining the starter check out the post on ginger bug starter. In general, to keep your starter active feed it 1 tbsp of ginger and 1 tbsp of sugar with 1/4 cup of water whenever you take out 1/4 cup of starter (or at least once a week). Emillie! My name is Emmilie! Haha. Thanks for the recipes! Don’t you love creative parents. 🙂 Enjoy! Do you think I could bottle my sodas (like beer?) to be able to store them for longer periods in a cold room? The long answer… you would need to brew them more like a beer. Keep everything sterile. 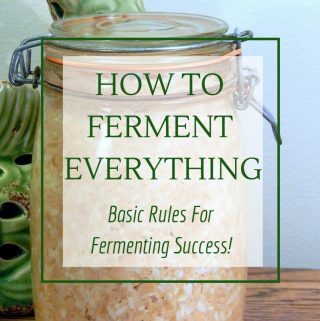 Brew your second fermented with an airlock. Continue to ferment until it stops bubbling. Then bottle, adding a bit of sugar to get it to carbonate while in storage. Personally, I haven’t done it. I usually stash bottles in my fridge and drink them within 2 months. Hello. I have been enjoying your ginger bugs recipes. I’d like to advise others to please heed your warning about the possibility of bottles exploding from the pressure. I used a bottle I purchased from Target that had a lid that seemed just right. It exploded in my kitchen the day after I bottled it. It made a heck of a noise and a real nice mess. Thankfully, no one was in the kitchen at the time. It could have been really bad with the glass all over the place. Loves these flavouring ideas. What kind of proportions are you using? 1/4 cup of bug liquid to 3-4 cups flavoured liquid? Each flavour will work with one batch of ginger bug, so if you were using juice, you would replace part of the water with juice. I usually use a mixture of 1 cup juice and 2 cups water (depending on the juice).